Spiritual fatherhood is one of the biggest things lacking in Christianity today. Men, women, boys, and girls of all ages are yearning for spiritual fathers and mothers. However, few people actually know how to find a spiritual father or mother. Few people have a parent-child relationship with a spiritual mentor. I believe the message of spiritual fatherhood and sonship is THE most helpful and life-changing message that Christians need today. Just last week, a friend of mine told me she was discouraged because she had just realized that she has no spiritual fathers in her life. Unfortunately, that is true for most people. People need fathers. The need is desperate. I personally longed for a spiritual mother and father for many years. That entire story is in the book, as is the story about how I finally found them. Finding spiritual parents changed my life forever. My spiritual parents have loved me, disciplined me, taught me, prayed for me, encouraged me, and believed in me. They are irreplaceable. Do you also long for a spiritual father? 1. First, become a faithful, covenant member of a local church. Spiritual fatherhood is about covering. (And when I say “covering,” I mean a person who watches your back and serves as a spiritual mentor, intercessor, advisor, and a layer of protection in the spiritual realm.) It’s about finding someone who will be a covering for you; who will watch your blind side; who will teach you things you don’t know. This kind of protection can only happen within the over-arching, corporate covering of a local church. Why? Because your father can only have authority as much as he is under authority. Your spiritual father has to be under the authority of a local church and its pastors in order to have authority to teach you. God loves the local church. He planned it, He made it, He builds it. And you will only find the covering, teaching, wisdom, and encounter with God that you desire in the local church. So find a good, powerful, Spirit-filled church, and commit to be faithful in attendance and in serving today. 2. Determine what your spiritual callings and giftings are (even if only for your current season). Unlike biological parents, God generally aligns spiritual fathers and sons who are gifted in the same area, or who are called to the same ministry. Thus, before you look for a spiritual father or mother, it makes sense to figure out what you’re called to first. If you don’t know yet what your gifts and call are, it’s ok. You can just look at what you are called to right now, and look for a spiritual father in that arena. You don’t have to have your whole life figured out to find someone who can mentor you. What kinds of messages make your spirit leap inside you? What moves you to tears? What makes you whisper? What do the messages that impact you the most have in common? When you have identified a theme that is important to you, consider whether or not this may be part of your calling or spiritual gifts. Again, you don’t have to figure all of life out from now until Kingdom Come. If you think you know what your lifelong call is, great! But if not, it’s no big deal. Look at your call right now. That should be far more obvious. When I was going through the process of identifying my call in life, I asked myself these questions as well. I love seeing broken, downcast people be lifted up in spirit, soul, and body. I hate poor-mouthing attitudes and words. I love to hear about what God is doing right now. Putting all of these things together, I realized I am called to help equip and encourage people to live powerful lives. I do that by speaking the right-now word of God. God’s Word heals, encourages, strengthens, and empowers. Putting all of that together equaled preaching and prophetic ministry for me. You may have the same passion for children’s ministry, evangelism, music, teaching, or feeding the poor. Whatever your passion is–even if you can only identify your passion today, and aren’t sure about the rest of your life–that is where you will need to look for a spiritual father. Those are the first two steps to finding a spiritual father or mother. 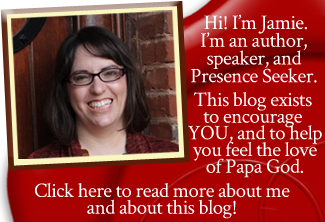 I address the next steps in the next two post in this series. In the meantime, go ahead and commit to your church. Identify your passion and call, at least for your current place in life. These two things will set you up for the next level of growth. Is Holy Spirit speaking to you about this subject? Does this post resonate with you? Please leave a comment below if so! I’d love to hear what you think. Excellent word, Jamie and as you state—so needed. Thank you for these insights. Looking forward to reading the next part! Thanks, Karen! Part 2 is here and part 3 is here. Such a sad thing – we have forgotten that we’re supposed to become like God (our Father) in every way. We’ve embraced discipleship methods that satisfy our flesh–like “That was so-and-so’s last chance,” and in large part we’ve abandoned the quest for Christlikeness in discipleship. I pray the Body would wake up to begin making disciples like Jesus did. He shared His life with the 12. That kind of one-on-one fathering and mothering (w/raising up other people to become spiritual parents as well) is the only way we can multiply enough to see a billion-soul harvest. Thanks for your lecture and i did enjoy it , now i know how to look for my spiritual father and i also pray God should lead me too. But if one miss it at first, can it be corrected? THANK YOU SO MUCH I REALLY NEED THIS I HAVE BEEN LOOKING FOR MY SPIRITUAL MOTHER FOR YEARS I HAVE NOT FIND HER YET. HELP THANK LORD JESUS. This has been really helpful. However i have some questions. How young can a spirital father be? Can he be your age mate? He can be older or younger than you. (Or she, if we’re talking about a spiritual mother.) Age doesn’t matter. Spiritual maturity and ability/willingness to mentor are what matter. Thanks a lot for the insightful teaching. I am at the point where I need a spiritual father. My fiancee has and she’s doing very fine and I want same. I am moved by teachings and ministry of men like Smith Wigglesworth. I saw a dying girl being carried by her family and I was moved to pray for her. She’s alive until now. Whenever I see hopelessly sick people I am moved to pray for them. I just don’t like seeing people in such a situation. I also love teaching the word of God. I really don’t know the right word for such ministry. I belong to a local church and the senior pastor or overseer has such gifting. During our conventions I see lame people walk. However, he teaches mostly on old testament. Nothing much about the new life in Jesus and Grace. More so, the church has over 5million members and the senior pastor is a father to other general overseers whose church can boast of over 2million members. There’s no chance for me to even see him much less be fathered by him. And the pastors around me even in other churches and my local church don’t seem to have the kind of gifting I know I have. How then do I go about having a spiritual father? Thanks. Hi there! 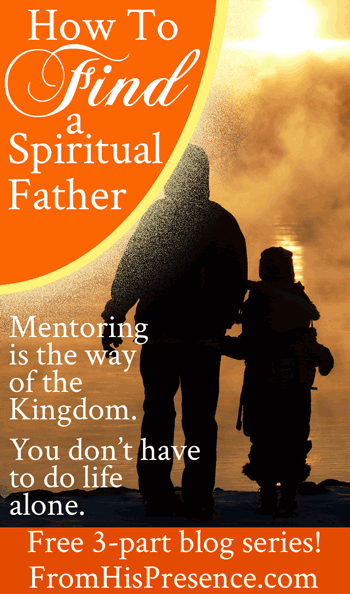 So glad you are looking for a spiritual father/mentor! Just follow the steps in Parts 2 and 3 of this series! And God will lead you to the right person. You are doing a wonderful job for God. I am encouraged and feel highly blessed that I by chance stumbled on to what I call a gold mine because of its spiritual wealth. You seem to have everything that I need for my spiritual growth. If I may aske please, how does one qualify to become your spiritual son/ daughter? Kindly, let me know since I have been searching for a true God servant like you’re to mentor me. Patiently waiting for kind reply. Hello, thank you for your encouragement and thank you for asking about mentoring. I am unable to offer personal mentoring at this time but I do recommend Minister Antoinette Miles for mentoring if you would like to be mentored. She is a powerful woman of God and has many years of experience mentoring, preaching, teaching, prophesying, and even years of experience in business. I highly recommend her! Hello Jamie! Thank you for your kind reply and recommendation of a spiritual mentor. I am quite appreciative of your recommendation and will soon make a postive move on that direction after putting things in order on my part. God bless sister in Jesus Christ. Hi I’m Clayton William im very much Happy to know more about a spiritual father , at least I’ve learned a lot so that I will be able to teach others about this subject .